"It is a very disguised sort of digitized voice that indicates that there's a bomb in the building, and then there's some pretty horrific rhetoric about hurting Jewish people," she says. The calls have thrust JCCs around the nation into repeated evacuations. Elderly women doing water aerobics and babies in daycares have been rushed out to the streets, and whole communities have been rattled. "Everybody's no more than one or two degrees of separation from someone whose kid ended up on a sidewalk in front of a JCC over the last couple of weeks," says Jeremy Burton, the head of Boston's Jewish Community Relations Council. He says the current uptick in anti-Semitism is particularly disconcerting to younger Jews. "Frankly, it's bit of a shock," Burton says. "And maybe we are a bit naive, but we sort of maybe assumed that it was something we had mostly left behind." Jewish leaders across the nation who've been frustrated that the threats have gone on so long have been calling on the federal government to do more to help protect their institutions. Two hundred leaders joined a conference call Wednesday with the DHS that ended with officials promising more support. That will include assessing where JCCs are vulnerable to helping them improve security. 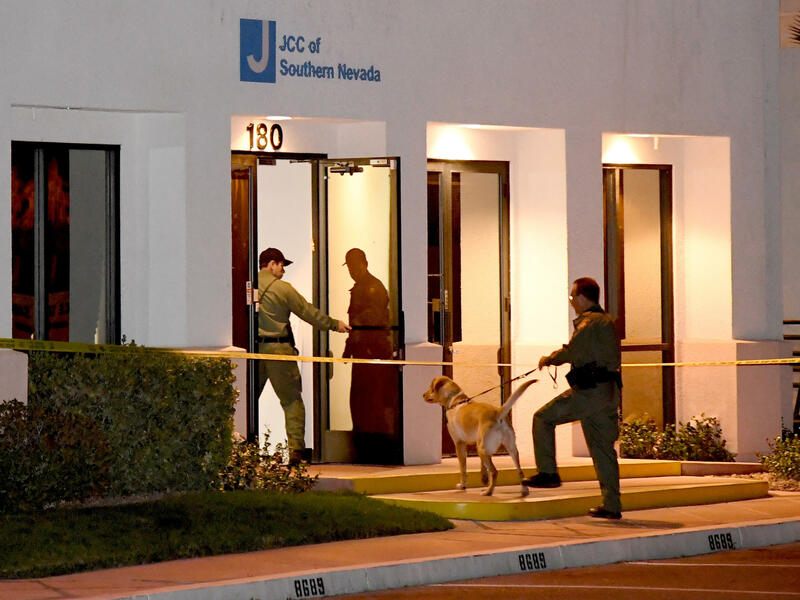 Bob Kolasky, the acting deputy under secretary for the National Protection and Programs Directorate at DHS, says JCCs will be trained on everything from dealing with an active shooter to managing the current bomb threats that seem to be intended to cause more fear than harm. "The advice that we will give is how do you deal with something you think is probably not likely to come to fruition," he says. "We're not going to tell an organization not to evacuate, but we're also going to teach them some of the telltale signs that may help make that decision." Lynch says the federal expertise will go a long way to help secure JCCs like hers in Alabama. "This outreach is unprecedented, and it's much, much appreciated," she says. She also hopes it will help reassure members and even persuade some families who've left in fear to return. "I think that feeling of knowing that this really is not OK with people reassures us that while we're in a difficult period, the federal government has decided that they're standing with us as well," she says. But others were more circumspect. The Anti-Defamation League calls the federal support an important step forward, but insists more must be done, including new federal policies that will crack down on hate crimes more broadly. Many Jewish leaders are also imploring the federal government to expand efforts to find the perpetrators. "In the end, the only response that's going to be adequate for us is catching these guys," says Mark Sokoll, CEO at Jewish Community Centers of Greater Boston. Authorities should do more so that "these people who are filled with hate can be brought to justice, and this can stop," he says. In the meantime, security is tight at Jewish institutions — like it was at a Boston event Wednesday. "I mean, look at this synagogue," says Helene Weitzenkorn, an attendee. "They are checking people going in here. I've never seen them have even a metal detector." She calls the current climate of anti-Semitism palpable. "I mean, I'm almost 64, and I have just never felt this scared," she says. Others took a longer view, noting anti-Semitism's long history. The echos are disturbing, as one put it. But they're also a reminder that this too shall pass. American Jewish institutions have received more than 120 bomb threats in the last two months. Now the Department of Homeland Security is increasing its support. As NPR's Tovia Smith reports, Jewish community centers have been pressing for the help as they've been targeted by waves of threatening calls and vandalism. TOVIA SMITH, BYLINE: Ever since January, the calls coming in to Jewish community centers have been both vivid and unnerving, much like the three that came into the JCC in Birmingham, Ala., where Betzy Lynch is executive director. BETZY LYNCH: It is a very disguised sort of digitized voice that indicates that there's a bomb in the building, and then there's some pretty horrific rhetoric about hurting Jewish people. SMITH: The calls have thrust JCCs around the nation into repeated evacuations. Elderly women doing water aerobics and babies in day care have been rushed out to the streets, leaving whole communities rattled. JEREMY BURTON: Everybody's no more than one or two degrees of separation from someone whose kids ended up on a sidewalk in front of a JCC over the last couple of weeks. SMITH: Jeremy Burton, head of Boston's Jewish Community Relations Council, says it's particularly disconcerting to younger Jews. BURTON: Frankly, it's a bit of a shock. And maybe we are a bit naive, but we sort of maybe assumed that it was something we had mostly left behind. SMITH: Community leaders across the nation who've been frustrated that the threats have gone on so long have been calling on the federal government to do more to help protect Jewish institutions. Two hundred of them joined a conference call yesterday with Department of Homeland Security officials that ended with the promises of more support. That will include assessing where JCCs are vulnerable and helping them improve - for example, says DHS's Bob Kolasky, how to deal with an active shooter or how to manage these current threats that seem to be intended to cause fear more than harm. BOB KOLASKY: The advice that we will give is, how do you deal with something that you think is probably not likely to come to fruition? We're not going to tell an organization not to evacuate, but we are going to teach them some of the telltale signs that may help them make that decision. LYNCH: This outreach is unprecedented, and it's much, much appreciated. SMITH: Betzy Lynch says the federal expertise will go a long way to help secure JCCs like hers in Alabama, and she hopes it'll also reassure members and persuade some families who've left in fear to return. LYNCH: And I think that feeling of knowing that this really is not OK with people reassures us that while we're in a difficult period, the federal government has decided that they're standing with us as well. SMITH: But others were more circumspect. The Anti-Defamation League calls the federal support an important step forward but insists more must be done. For starters, Mark Sokoll of the Greater Boston JCC says authorities should expand efforts to find the perpetrators. MARK SOKOLL: In the end, the only response that's going to be adequate for us is catching these guys, that these people who are filled with hate can be brought to justice and this can stop. UNIDENTIFIED WOMAN: Security right over here and then IDs and registration. SMITH: Meantime, security is tight at Jewish institutions, like at this Boston event last night. HELENE WEITZENKORN: I mean look at this synagogue. They are checking people going in here. I've never seen them even have a metal detector. SMITH: Helene Weitzenkorn calls the current climate of anti-Semitism palpable. WEITZENKORN: I mean I'm almost 64, and I have just never felt this scared. SMITH: Others took a longer view, noting anti-Semitism's long history. The echoes are disturbing, as one put it, but they're also a reminder that this, too, shall pass. Tovia Smith, NPR News, Boston. (SOUNDBITE OF PUNCH BROTHERS SONG, "JULEP") Transcript provided by NPR, Copyright NPR.